Delivering bottled water is a 5,000 year old technology that requires someone to transport good water to places that don’t have any. With small reverse osmosis drinking water systems we have been helping our residential customers produced bottled water quality water right at their sinks for decades. However in most businesses, sinks aren’t always readily available and many people like to have both hot and cold water available instantly. 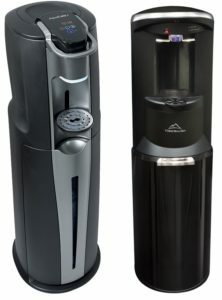 So at Culligan of Houston we set out to find a better solution to bottled water in offices. No confusing invoices – With a Bottle-Free® cooler from Culligan of Houston, you get 1 invoice per month. A simple flat rate to pay every month.